The below artworks are the most important by Sofonisba Anguissola - that both overview the major creative periods, and highlight the greatest achievements by the artist. Artwork description & Analysis: Possibly Anguissola's most recognisable work, The Chess Game is an intimate insight into the domestic, female world of sixteenth century Italy. Three young girls can be seen playing chess in the foreground, while an older woman, perhaps the Anguissola family's maid, is sitting behind them and watching their game. On the left, the artist's younger sister, Elena, gazes calmly towards the viewer while her hands indicate that she has just defeated her sister who sits on the right. Minerva, with her hand raised in defeat and disbelief, gazes with parted lips at the conqueror. The youngest girl, Europa, stands beside Elena and grins cheekily at the despondent loser. Her laughing expression recalls the drawing of the laughing girl in Boy Bitten by a Crawfish that Michelangelo had so admired, and perhaps this was Anguissola's sly way of immortalising her praised work. The painter has masterfully captured the details in the elaborate clothing of her sisters, using her pigments to highlight the braids wrapped around their heads, or the ruffled collars under their chins. Artwork description & Analysis: In the dark artistic studio, Anguissola's first painting tutor, Bernadino Campi, appears to loom out of the shadows. He has turned to make eye contact with the viewer over his shoulder as he paints a large-scale portrait of his pupil, Anguissola Anguissola who is dressed in an elaborate, crimson gown with an open collar and gold trimming - a much more fashionable and expensive garment than the usual black gown that she wears in many of her other self-portraits. 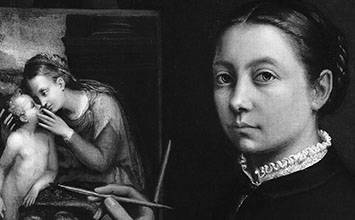 This is perhaps because for the first time, Anguissola has become the subject of her own painting. Rather than the usual stoic, studious, contemplative artist, Anguissola feels more able to depict herself as fashionable and jovial. The illustration shows the painting mid-conservation, where there is a clear pentimento (that is, a portion of the painting that the artist herself covered up as she changed her mind about the composition). Importantly, Anguissola painted a second left arm onto her body, which reaches up and appears to merge with Campi's hand. Anguissola was unsatisfied with this composition, finding a subtle way to show that she was the original painter of the portrait, which the viewer can discern by the play between the painting inside the painting, the artist, and the viewer. The way in which both portraits are painted suggests that Anguissola was a better painter than her teacher. The composition suggests that Anguissola is standing outside of the picture frame, painting her teacher painting her. His face is naturalistic and engages the viewer in a lively way, while the painted Anguissola, presumably by Campi, is simplified and stiff. The way Anguissola has painted herself as bigger and brighter than Campi also suggests that she was demonstrating the superior quality of her art. Artwork description & Analysis: In this large state portrait, Anguissola has captured the likeness of the newly-married Elisabeth of Valois, Queen of Spain. Dressed in swaths of black cloth, which was the most expensive color due to the complex dying process, and decked in pearls and rubies from neck to the hem of the dress, Elisabeth shows herself to be a wealthy Renaissance queen. The open sleeves of her outer gown reveal the striped yellow sleeves underneath, and the expensive white silk lining of the outer garment. She wears a bejewelled coronet, necklace and girdle with precious stones while her hands bear numerous finger and thumb rings. In her right hand, she holds a miniature portrait of Philip II of Spain, her husband, which is a public display of love and affection for her new spouse even though it was probably Phillip who commissioned the portrait of his wife. Elisabeth leans against a large marble column which suggests that she is standing within a grand palace, which again hints at the couple's wealth, power and luxurious lifestyle. In Renaissance and early-modern visual culture, the pearl had significant symbolism, especially for women. Therefore it is unsurprising to see the knotted strings of pearls decorating Elisabeth's gown. Pearls were thought to symbolise not only extreme wealth, but also female fertility, as the pearl was thought to be 'born' within the shell of oysters. Thus, in this state portrait the numerous pearls hint at the future children that Elisabeth will bear Phillip. Unfortunately, it would be her fourth pregnancy and second miscarriage which would end Elisabeth's short life. Artwork description & Analysis: In this strikingly modern portrait of the young Spanish princess, Catalina Micaela of Spain, the daughter of King Philip II and Anguissola's friend, Queen Elisabeth of Valois, the girl looks out at the viewer from a sea of white and black. Around her neck and spilling down her front is the collar of a cape made of ermine stomachs or lynx furs. While the overall image may seem subdued and unflashy, this monochromatic garment is an indication of royalty; the infanta is actually displaying her noble heritage, wealth and prestige. Catalina Micaela's pale hand, with its rings and gold lace cuff, and her necklaces peeping through the gauzy fabric around her head, are other indications of her great wealth. Similarly, her snow-white skin was seen as a sign of beauty and social rank. It is likely that this was shown to potential suitors in the hope of finding her a husband. Her direct gaze engages the viewer confidently. When Catalina did marry, she was initially disliked by her husband's courtiers due to her confidence in her own intelligence, which was seen as arrogant. Later, though, she would be praised for her ability to rule. She would die at the age of 30, after the difficult birth of her last child in 1597. Artwork description & Analysis: In a cyclical way, Anguissola has finished her life's work the same way she began it - with a self-portrait. The artist shows herself majestically seated on a red velvet tasselled chair, which contrasts with the usual sombre, dark clothing that she can be seen wearing throughout most of her self-portraits. In earlier portraits she paints herself at an easel with brushes and palettes in hand, playing a musical instrument, or holding the emblems of her noble family - attributes that she promoted as a prospective young courtier. Here she shows herself as a woman of letters. In her right hand she is holding a letter, while she holds a book in her left hand, marking her place with her index finger between the pages. Anguissola's lined face and deeply hooded eyes suggest that she recognizes that this painting might be her last as she maintains eye contact with the viewer. She understood the power of art to survive through time, and uses it here to commemorate her own life and reputation.